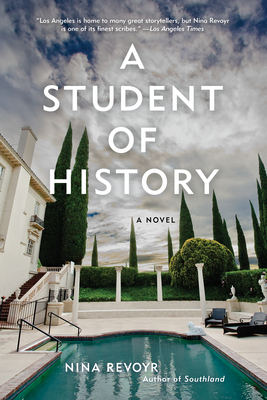 "Any Nina Revoyr novel is a cause for celebration, and her latest, A Student of History, is assured and marvelous, an absorbing rags among riches tale about a broke USC grad student who finds himself swept off his feet by Los Angeles's insular, powerful .01% class. It's a contemporary novel that feels like an instant classic, with the wry tragedy of The House of Mirth, the sinister glamour of Sunset Boulevard, and a fresh, original point of view." "A perfect snapshot of nature tamed and bent toward a very particular world vision, and a perfectly uncanny first image for Revoyr's unsettling tale of Los Angeles across the eras, always glittering, always hiding something corrupt." "A Student of History is full of research, detail, lush descriptions, and visual place-setting. Revoyr's] a fiction writer with an eye for reality set in a dream-like world, often in her home city of Los Angeles." "Revoyr's quick plot keeps the pages turning." "With her two Walter Mosley-like gifts--impeccable narrative pacing and masterful command of Los Angeles' intricate, evolving dynamics of race and class--Nina Revoyr's LA novels convincingly capture the lifespan of Los Angeles as a major city, none more gracefully than A Student of History." "Masterfully and intimately suspenseful...Shrewdly delineated scenes, loaded conversations, and a delirious surge of desire caustically expose Los Angeles's] toxic ruling-class legacy of prejudice and entitlement, while stoking questions of privilege, trust, and betrayal. Wealth and power, Revoyr confirms in this taut, commanding, and delectable novel, are not shields against folly, crime, or sorrow." "An entertaining, crisply written tale...evokes echoes of Great Expectations, The Great Gatsby, and a lot of Raymond Chandler, but with a thoroughly 21st-century setting...Revoyr's sleek prose and fast pacing move the reader through the sharply observed world of old money and the bad behavior it protects." Rick Nagano is a graduate student in the history department at USC, struggling to make rent on his South Los Angeles apartment near the neighborhood where his family once lived. When he lands a job as a research assistant for the elderly Mrs. W--, the heir to an oil fortune, he sees it at first simply as a source of extra cash. But as he grows closer to the iconoclastic, charming, and feisty Mrs. W--, he gets drawn into a world of privilege and wealth far different from his racially mixed, blue-collar beginnings. Putting aside his half-finished dissertation, Rick sets up office in Mrs. W--'s grand Bel Air mansion and begins to transcribe her journals--which document an old Los Angeles not described in his history books. He also accompanies Mrs. W-- to venues frequented by the descendants of the land and oil barons who built the city. One evening, at an event, he meets Fiona Morgan--the elegant scion of an old steel family--who takes an interest in his studies. Irresistibly drawn to Fiona, he agrees to help her with a project of questionable merit in the hopes he'll win her favor. A Student of History explores both the beginnings of Los Angeles and the present-day dynamics of race and class. It offers a window into the usually hidden world of high society, and the influence of historic families on current events. Like Great Expectations and The Great Gatsby, it features, in Rick Nagano, a young man of modest means who is navigating a world where he doesn't belong. Nina Revoyr is the author of five previous novels, including The Age of Dreaming, which was a finalist for the Los Angeles Times Book Prize; Southland, a Los Angeles Times best seller and "Best Book" of 2003; and Wingshooters, which won an Indie Booksellers Choice Award and was selected by O, The Oprah Magazine as one of "10 Titles to Pick Up Now." Revoyr lives and works in Los Angeles.